Introducing Fortify Probiotics, Fortify Women’s Probiotics, and Fortify 50+ Probiotics. Three powerful formulas containing 30 billion active cultures in every serving designed to promote gastrointestinal health. 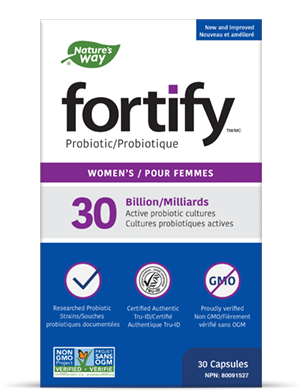 Introducing Fortify Probiotics, Fortify Women’s Probiotics, and Fortify 50+ Probiotics. Formulated with Lactobacilli and Bifidobacteria to support healthy daily digestion, Fortify is guaranteed to deliver 30 billion active cultures in every dose. Our formulas also contain the researched strains Lactobacillus NCFM® and Bifidobacterium lactis Bl-04® for a science based digestive solution. A pill passing through the stomach to the intestines. 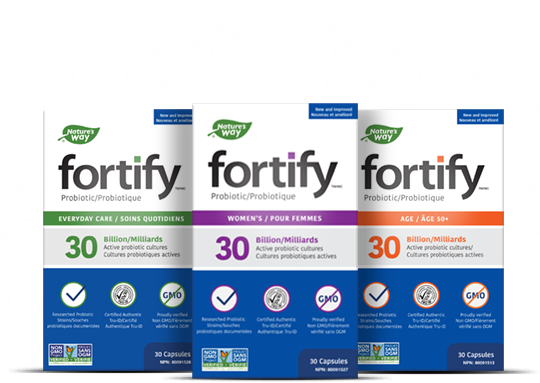 All Fortify capsules are constructed from natural plant-based material, designed to delay the release of the helpful probiotics. This helps to ensure the beneficial probiotics that aid with digestion survive the stomach’s acidic environment and reach the intestines. A pill dissolving through the intestines. Designed to suit women’s unique needs. Designed to help support gastrointestinal health. Designed for men and women aged 50+. Designed to suit women’s unique health needs. 30 billion active cultures per serving. Researched strains Lactobacillus NCFM® and Bifidobacterium lactis Bl-04®. 3x more probiotics than leading brands1. Designed to suit the unique health needs of men and women aged 50+. Probiotic strains are identified by a set of letters or digits. For example in Lactobacillus acidophilus NCFM; the genus is Lactobacillus, the species is acidophilus and the strain is NCFM. Research based strains such as Lactobacillus NCFM and Bifidobacterium Bl-04 have been studied in a number of clinical trials. are available at most major retailers.